Hamsters deserve the best treatment from their cage to diet. Regular water intake is no exception. Especially in the summer, a well-hydrated body can save the rodent from the scorching heat. Water bottles are preferable to dishes in containing water. Since some types can malfunction, frequently leaking water, we’ve searched for the best hamster water bottle on the market to give you a sensible choice. 3.1 How to a DIY hamster drinking water bottle? 3.2 How to stop hamster water bottle from leaking? 3.3 How to tell if the hamster water bottle is working? 3.4 How to a DIY hamster water bottle holder? 3.5 How high should a hamster drinking water bottle be? Choco Nose created this product based on their years of looking after pets. This H128 model is a cost-effective and sturdy solution to keeping hamsters well-hydrated. It uses the advanced technology of No Drip that ensures no water leakage even in case the bottle is jostled. The product also strikes customers as an eco-friendly idea in the sense that it applies water nozzle. It is designed to reuse the regular PET bottles. As a result, you can keep your house dry and clean while your little rodent can enjoy fresh and clean water. The screw-on bracket is convenient and user-friendly. You can easily snap the bottle on and off to refill water or clean. The nail-on design of the bracket allows you to nail the bottle to the pet’s wirehouse, the wall or wooden furniture with screws. Don’t forget to tap the metal ball inside the nozzle daily to make sure it is working properly. After refilling the bottle, tapping the ball until water comes out and air bubbles occur. That’s when the bottle is ready for use. The bottle isn’t fit for squeezing in all cases. Tightening the bracket isn’t recommended. Rinse the nozzle on a weekly basis to clean dust. Convenient design for frequent cleaning. Another product launched by Choco Nose is this H125 patented no drip water bottle. It is easy to understand why the product is listed among the best hamster water bottle models nowadays. Like the above-mentioned H128 model, it shares many common features, including No Drip design, steady mounting system, and diverse nozzle. However, it is smaller in size. If you want a larger reservoir, it is simple to replace the bottle with a larger one. Therefore, your petite pet is likely to fall in love with the H125 model at first sight. The size of the nozzle is also reduced to ensure your pet can have a comfortable drinking experience. The product comes with a mounting kit to facilitate cage attachment. The installation is very simple. Start with inserting the drinking tube through the crate door or the wire cage side. Then, check the position of the snap-fit attachment of the bracket. From inside the cage, tighten the screw. As a result, the water feeder is fit for snapping on or off to refill or clean. Small size is suitable for infant hamsters. The nozzle is reusable to go with old PET bottles. If your hamster has a fondness for chewing, then Kaytee’s water bottle makes a great choice. It is made from sturdy glass, minimizing the chances of pets gnawing it to pieces. 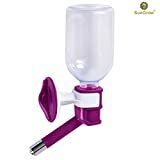 The producer pays great attention to its design, ensuring your pet can get the ideal amount of water while drinking comfortably from the bottle. One special thing about this Kaytee water bottle is the inclusion of a small floating duck. It acts as an effective and fun reminder to frequently refill the bottle since a purple duck obviously stands out from the water. The bottle is made resistant to leaks so you can rest assured that it can perfectly hold water. Its cap is made from stainless steel, ensuring durability and long-term usage. 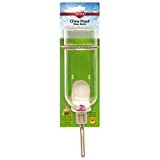 There is a spring attachment hanger to securely hold the bottle in place outside or inside your pet’s wire home. Therefore, the rodent can’t knock it down easily. Compared to other plastic models, this one seems a little heavier, but this doesn’t matter much. Durable thanks to the materials of glass and steel. Contains a floating duck indicator. Kordon has introduced this Oasis Value Set that includes a rigid plastic bell bottle and a basic hold guard. They both have a special design that serves to fit the bottle safely and properly. Made of crystal styrene, the bottle can retain water well while standing up to breakage. The rounded top proves helpful in discouraging chewing and keeping the inside water intact. 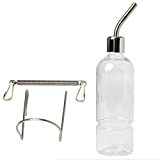 The strap is adjustable so that you can hang the bottle over top edges of most aquariums and wire cages. The bright color of the product doesn’t prevent you from seeing the water level inside clearly. Based on my own experience, this bottle is worth your investment since it lasts for a long time. Attractive design with blue floral patterns. Hold guard aims at minimizing spillage. With a compact design, the B.C hideout drinking waterer is a perfect blend into your confined space. This bottle features a premium roll ball in the nozzle to prevent leaks and minimize chances of your hamster spilling out the water. The materials of metal and plastic prove durable, making the bottle stand up steadily on its base. As a result, you don’t need to worry about it tipping over while at the same time your rodent can safely enjoy the fresh water. Such a free-standing design also eliminates the need to place the product outside a cage or tank. In addition, the plastic is verified anti-odor and anti-dust so you can be confident about the quality of the water. It is very simple to take the bottle out of the base for refilling or cleaning. The versatile stand allows you to change the water container for a smaller or larger one. There are five colors available on the market so you can choose the one to your pet’s liking. A small nook acts as a suitable hiding spot for small rodents. Base compatible with most hamster bottles. 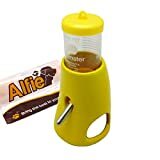 Like the product of B.C, this best hamster water bottle launched by Alfie includes a small hideout at the bottom to offer fun nesting and resting. Your small animal can use it as a safe harbor with lookout holes. It proves extremely helpful in case the rodent likes to sleep in the daylight but doesn’t want to be bothered by the sun rays. At the same time, you can keep an eye on it from outside. Made from transparent plastic, the bottle is resistant to odors and easy to clean. 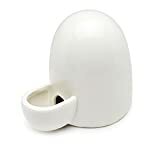 The base is made from ceramic so it is sturdy enough to withstand chewing or knocking over from hamsters. The producer boasts a compact design which is space-saving, thereby creating more room for the rodent to play around comfortably. The no-drip design helps prevent water leaks and save your pet’s house from being messed up. An ideal combination of a water container and a cozy place to sleep. Available in a wide range of light colors. Lixit designs this water bottle especially for small rodents including hamsters. It includes a small floating turtle that serves as a reminder whenever the bottle needs refilling. The product comes with tape so that you can easily attach the bottle to the side of glass tanks. A clip system helps to remove the bottle from its mount; therefore, you don’t have to seek new tape every time you want to clean the bottle. Made from stainless steel, the nozzle is designed to last for a long time and resist chewing. 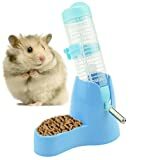 With the unique mounting system, the product is worth a try, especially in case you raise hamsters that like climbing. They can’t reach it to push it down while your pet can stay properly hydrated. This guide helps you to pick the right food for your rodent. 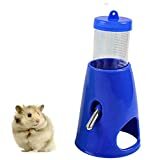 If you plan to leave your hamster alone for a while, this SunGrow bottle is a must for you, clearing away the worry about your pet getting too thirsty. With the volume of 10 oz., the water dispenser ensures to keep it hydrated while keeping its cage in order. The product is designed to be hanging to prevent dripping. The roller balls are made from stainless steel, serving to block the tip of the hose. This means water doesn’t pass through until the rodent pushes the bottle to drink. The stainless steel drinking head features a small roller ball to facilitate drinking. At the same time, it won’t rust so not polluting the water inside. The nozzle is measured 0.3 inches, which is ideal for small animals like hamsters. It is also chew-proof and mess-free, proving helpful in preventing curious pets from chewing the drinking head. The mechanism of no-drip drinking is also applied in the design of the sipper tube. It ensures even sensitive pets can drink without getting hurt or wet. In terms of installation, the bottle is easy to set up. You can either attach the screw-on bracket to the cage or nail the bracket onto wooden furniture or a wall. To take the bottle out, you don’t need to unscrew the whole construction. Simply snap it off the bracket. Reattach the bottle to the bracket in a vertical position after rinsing it carefully. Small-sized nozzle fit tiny mouths. Caring for hamster eventually improve its lifespan. Another product from Kordon is the SOA80304 bell bottle. Like other products of the same producer, this one features a rigid bottle and sturdy holder. The guard is coated with powder to support color coordination with the cage and other accessories. The top is made rounded to prevent chewing and protect the bottle from chewing damage. There is an adjustable strap for hanging over the top edges of most aquariums and cases. It can contain an amount of 4-ounce water. Made from crystal styrene, the bottle guarantees to stand up to breakage. A good blend of form and function. Dahey is devoted to creating products that can bring out the most convenience and enjoyment of pets. This best hamster water bottle is no exception. What impresses customers most is an outstanding outlook. The bottle looks like an egg or an igloo with an opening. The hamster can drink water directly from here. In addition, you can blend the water container into the interior furniture as an item of decoration. Designed to be leak proof, the waterer is equipped with an automatic feeding system to ensure the water is always clean and fresh. The small size is perfect for small animals, including hamsters. The high-quality ceramics deem good for pets’ health. Compared to some other products, this bottle functions silently so your little friend isn’t bothered while you can sleep well. Start with keeping the hole horizontal to put the waterer inside. Then, tilt the waterer so that you can pour the water into the hole. Creates no noise during operation. If you’re worrying about hamster biting then this guide helps you. When you are seeking the best hamster water bottle, this complete kit shouldn’t be neglected. There is a stainless steel ball at the end of the nozzle. It will open once hamsters drink water from it. Otherwise, it will automatically stay locked. Therefore, you don’t have to worry about water leaks. Thanks to plastic, the bottle boasts light weight and durability. It can hold up to 350 ml of water. A spring rope is enclosed in the package to enable customers to fix the bottle on the cage easily. It takes you little time to customize its position. Upon the first time of use, you might detect water dripping. Don’t be panic because this is a natural phenomenon. Just patiently wait for the pressure of the bottle to balance, then such incident will no longer occur. Plastic bottle ensures long-term usage. Roof hold convenient for suspension. Not easily permeable ball faucets. As suggested by its name, the water bottle of Living World is widely known for its environmental friendliness. The whole construction is made from recycled glass, which means you are making a contribution to the global community’s environmental preservation efforts. At the same time, it is safe for use and durable. The design is innovatively made to satisfy the natural instinct of hamsters, enticing them to drink more. There are a double ball-bearing and drip-resistant tube. The bottle also includes a water level indicator to help you control the volume of water better. Cleaning and installation is a piece of cake. A spring attachment and hanger are enclosed in the package. They are both secure and easy to set up. Apart from this 12-ounce sized model, there are 2 other sizes available on the market. Depending on the size of your pet, you can choose the most suitable one. A water level indicator included. If you are seeking the best hamster water bottle in terms of durability, this product of Newweic is a must-have item. The drinking bottle boasts a high-quality nozzle and stainless steel construction. Its durability is derived from the high-grade plastic base. It is also easy to clean and highly resistant to odors. The water container comes with a food compartment that is attached to the base. As a result, it can save the cage’s space for your little friend to play and sleep comfortably. You don’t have to prepare a separate food bowl and water bottle anymore. Newweic incorporates the automatic technology into this model so that the chance of your pet spilling out water is minimal. Stainless steel mouth and roller ball. A unique blend of water and food suppliers. Available in four colors: pink, yellow, blue, and green. Read More: These are the best tips from a Vet to give the best food for the lovely hamster. This water bottle makes a good choice for indoor use to help hamster lead a healthy life. It includes a stainless-steel ballpoint tube to ensure the freshness of water coming into your furry companion’s mouth. Its design serves to avoid leaks so you can be care-free about keeping the cage dry and tiny. The plastic is clear enough for pet owners to keep the water level under control. Some cute images of animals are printed on the bottle to meet your tiny rodent’s taste. Clear plastic for an excellent view inside. Perfect for indoor use and small animals. The last product I want to introduce today is this Lixit SLX0670 model. It really strikes customers with the wide mount, which turns out helpful in filling or cleaning the bottle. The double ball-point tube is made from stainless steel to ensure durability and fresh water. The water container can stand the test of weather. In other words, it is designed to use on outdoor cages. You don’t need to think about rain or sunlight damaging the quality of the bottle. It is durable and heavy duty enough to last for a long time. You can choose between the one with 64-ounce and 128-ounce capacity. It is highly recommended that you strictly adhere to the guide enclosed in the package to minimize excessive dripping. Wide mount bottle facilitates easy filling. Stainless steel double ball-point tube. Instruction enclosed to help with installation. How to a DIY hamster drinking water bottle? If you are a fan of DIY items, then a DIY hamster water bottle shouldn’t be an obstacle. Water bottles for hamsters aren’t too difficult to make. Therefore, you yourself can create the best hamster water bottle for your little friend. Normally, since hamster teeth tend to grow throughout their lifespan, water bottles stand a high chance of being damaged by chewing. In this case, a DIY one can make a good replacement. Step 1: Inside the cap of the water bottle, leave a mark on the center. Step 2: Pierce the cap at the mark with a hammer and a large nail. In case the nail may go through the cap, remember to place the cap on a secure surface. Step 3: Replace the cap on the water bottle. Step 4: Use the power drill with a 1/4 –inch bit to drill through the cap at the starter hole. Hold the bottle securely while drilling slowly. Step 5: Take the cap off. Step 6: Use silicone to get the rubber stopper stuck on the outside of the cap so that the holes in the bottle and stopper are in the same line. Step 7: Let the silicone set for a few days. Step 8: Insert a plastic tubing accurately into the hole in the rubber stopper. Bend the tubing by an angle that is similar to that of a commercial water bottle for hamsters. Step 9: Carefully wash the water bottle to remove any pieces of plastic cap left. Dry the outside of the bottle. Step 10: Start from the bottom of the bottle, wrap the 12-gauge wire around the bottle a few inches up. This way will turn out extremely effective if your bottle has ridges. Step 11: Pour clean water into the bottle full. Step 12: Hang the bottle on the inside of the tank so that the tubing faces toward its center. Bend the wire over the edge and clip off any excess wire. Don’t hang the bottle too low; otherwise, water may flood the sleeping space of your hamster. How to stop hamster water bottle from leaking? If you attach the bottle upside down securely to a cage, the chances of tipping over are minimal. However, water dripping is unavoidable, even in the best hamster water bottle. One common source of the problem is vacuum pressure. When the water volume decreases, the pressure will be reduced and so will the vacuum strength. Reducing such strength too much will result in water leaking. Instead of buying a new bottle, fixing a drip is a more economical solution. Take the bottle out of the cage. Keep the drinking tube pointing upward while unscrewing the lid in an anticlockwise direction. Next, remove the lid from the bottle and remember to empty all the water in the bottle. Examine the rubber washer inside the lid to see whether it has become pliable or brittle. In case you can spot cracks, don’t hesitate to replace it with a new one. A damaged washer makes the seal not airtight enough to prevent water from dripping from the feeder tube. Clean the inside of the tube and the metal ball with a pipe cleaner. Since some hamsters tend to blow food out while drinking, food particles may be left inside the tube. Clean carefully to make sure there is none inside the tube. Then, clean the bottle thoroughly. For the inside, use a bottle brush and clean with fresh water. Pay attention to the threads linking the lid and bottle. Don’t let them covered with debris. Use a soft cloth to wipe out dust on the outside of the bottle and drinking tube. Fill up the bottle with clean water. As you put the lid on, squeeze the bottle if it is plastic. Make sure the lid is on firmly. Turn the bottle upside down before attaching it to the cage again. How to tell if the hamster water bottle is working? You can try running your finger over the ball bearing while holding the bottle with the stem downward. If there is water coming out, the water bottle is working properly. On the other hand, if no water comes out something wrong happens with the vacuum. Use your finger or a cotton swab to push the ball further into the sipper and let it drop back down. Try running your finger over it again to make sure water can come out easily. If you can see something like a thin stem inside the sipper, push it side-to-side to make way for water to come out. Almost every water bottle drips along with the temperature of the surrounding changes or after hamsters get a drink. Therefore, try not to place water containers near the windows where sun rays can reach and warm the bottles. Otherwise, algae may quickly form and spoil the quality of the water. Although it isn’t deadly enough to kill your rodent, it requires you to do the cleaning more frequently. How to a DIY hamster water bottle holder? For enhanced security, hamster water bottle holders are available to help you. Like bottles, you can make a DIY holder yourself. The steps are rather simple and easy to follow. Step 1: Identify which type of your cage. Cages for small animals can have solid or wire sides. Step 2: Decide on the height you want to place the water bottle. Roll the wire around the bottle and cut a length of wire that is two inches longer than that of the bottle. Make two identical pieces. Step 3: Get the water bottle attached to the cage. Depending on the type of your cage, there will be a different way of attachment. Bend the wires into a U-shape and wrap them around the front side of the bottle so that one heads towards the bottom and the other heads towards the top. Don’t forget to let the excess wire stick out towards the cage. Bend the excess wire and wrap it tightly around a wire on the cage. When you finish doing the same with four such pieces, clamp down on them with the pliers in order to keep them tight. Make two pieces of wire of the same length around the bottle like for a wire side cage. However, wrap them tightly around the bottle rather than letting the excess wire stick out. Link their ends together both on the bottom and the top. Based on your desired length to hang the bottle, cut two or four more pieces of wire with up to six inches of excess. Then, attach the top wire ring to the bottom one. Squeeze the pliers around the attached point for security. After that, bend the two pieces of wire until the bottle hangs down into the cage. Make proper adjustments so that there are about six inches of excess wire on the outside edge. Remember to secure them with strong tape. How high should a hamster drinking water bottle be? The build of your little friend will determine the height of the water bottle. Generally speaking, place the bottle within the pet’s reach without having to stand on its legs. However, don’t let the bottle plunge too low. Otherwise, the rodent may find a way to chew or damage it, leading to water leaks and even flooding the bedding. Read More: Hamster vet queries. Hamsters are easy to raise provided that you pay attention to buying high-quality accessories for such rodents. A good water bottle is among them. Our above-mentioned list of the best hamster water bottle models serves to save your precious time of searching through the online market so you can enjoy your private life more. Hope you have a good time shopping!